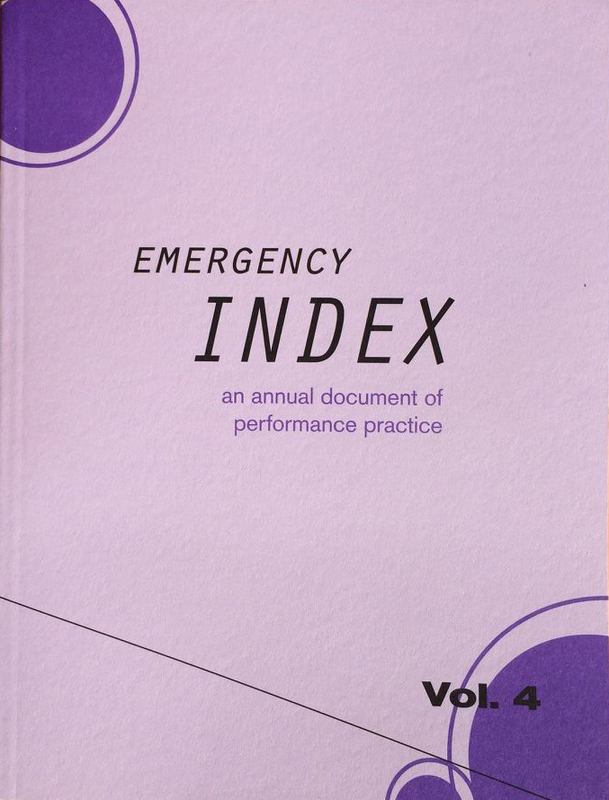 Marita Bullmann performance featured annual publication of Emergency Index Vol. 4 documenting more than 200 performances from 41 different countries made in 2014, described by their creators, and indexed by name, place, and common terms. “ONE OF THE MORE TIME CONSUMING STEPS in editing emergency INDEX is compiling the index of terms, that funny list at the back of the book that catalogs words, concepts, historical and conceptual references from hundreds of pages of text; terms are extracted and lined up neatly, each with their modest tail of page numbers extending outwards. In our case, it isn’t indexing software doing the extracting, but a human reader, scanner, disambiguator, gleaner, CTRL-F-presser, copy-and-paster who selects words that the author might have thought to be key to their project, or that some future reader might search for. Indexing software cannot accomplish this, and, perhaps, even a human indexer is far from perfect.